Over a period of many centuries since seamanship origin sea waves mercilessly swallow up hundreds of vessels every year regardless of their function, national origin and technical excellence. It seems strange and ridiculous at first glance, that scientific and technical development as a whole does not reduce the number of sea disasters, the number of which fluctuates between 350-400 cases every year. But most frequently it happens because of sea waves, collisions, loss of stability, grounding, fires and explosions on board. (Skryagin, 1986). People die, valuable cargo, mechanisms and equipment – silent witnesses of history and culture - go to the ground. Of course, every disaster is thoroughly examined by special commissions, technical equipment of ships and rules of navigation are improved, but there are cases where causes of disasters remain unfound in spite of all efforts of investigators. So, Russian clipper “Oprichnik” disappeared without a trace in the Indian Ocean in December 1861, sea cutter “Kamchadal” went down in Amur firth with all its crew in October 1859. Wreck of battleship “Lefort” on its passage from Revel to Kronstadt in the morning of September 10th 1857 was particularly tragic for Russian fleet of 19th century. In a heavy gale an 84-guns strong battleship turned over and went down within 2-3 minutes. It took to stormy deep all its crew: 13 officers, 743 lower ranks, 70 members of families, namely 53 women and 17 children. (Stetsenko, 1874, p. 79). So what really happened with the ship? Why both historians of Russian fleet and the public have interest to “Lefort”, though nearly 150 years have passed since its tragedy? By the middle of 1820th the Baltic fleet was not in the best shape. According to regular authorized establishment, approved as far back as by Alexander I there should have been 27 battleships in it, but only 5 ships were able to be on active service out of 15 ships being in commission on the list. New ships outweared in short time due to low quality of ship timber and metal parts. Nikolay I knew well the army and the navy of Russia due to his former activity and position, and when he took the throne, he understood the necessity of reorganization, which will radically change ways, established on the navy at that time. For the first time in shipbuilding details of larch timber for the new ship and other ships were made by Ya. Kolodkin according to the templates on Vetluga and then were sent to St. Petersburg by barges. Earlier chopped wood was rafted down the rivers to dockyards, were handling and sawing was made. On October 15th 1883 Shipbuilding and Accounting Committee received a letter № 5162 from Director of Shipbuilding Department from Directorate of General –intendant, Navy Department, which prescribed: “The Tzar in consequence of Minister of Navy statement royally ordered: to lay immediately an 84-guns ship out of larch timber, prepared by engineer lieutenant-colonel Kolodkin on Vetluga according to the templates for an 84-guns ship instead of the ship “Arens” and to dispose building of it in the Main Admiralty, but alongside with this to proceed all the other started and planned to start works and layings of ships. This royal will is declared by Shipbuilding Department to Accounting Department for execution so that the committee reported about its directions on this matter immediately. The new ship was named «Lefort” in memory of the first Admiral of Russian Navy, who was in command of the fleet in 2nd Azov campaign of 1696. Because of temporary detachment of lieutenant-colonel Kolodkin to Northern skerries for inspection of a wrecked ship, sorting out of prepared timber, delivered to the Main Admiralty as well as initial works on building of the ship were entrusted to staff-captain Lemuan. But soon there came a new directive – to lay and build the ship on New Admiralty, where all earlier stored timber should be moved. (RSA NAVY. f. 161, list 1, d.666, p. 9–15). Ceremonial laying of “Lefort” took place on November 18th 1833. By that time it was finally determined, what project “Lefort” will be built on. Nikolay I, who had weekly reports from the Navy minister about shipbuilding progress on dockyards of Russia, decided to take as a basis the project of 84-guns “Prince Vladimir”, which had been built earlier. (RSA NAVY. f.158, inv.1, d.745, p. 15–30; f. 327, inv. 1, p. 137–146, 397–400). Details, prepared on Vetluga were used as a basic set of the ship. Oak timber for keel, stem and other main components was found on other dockyards with serious difficulties. Pine planks for decks and for bordering were sawed up by sawyers from tree trunks just near the ship. Orders for metal works were carried out by admiralty Izhora plant. Lots of novelties were introduced on the ship. So, traditional stone ballast was substituted by pig-irons. Felt was laid under copper sheathing of the bottom. Beam ends were also coated by felt, and half-beams by kartuska paper. Interior trim was also improved: powder-room, exit from it and the deck on the exit were sheeted with lead. Brot camera and dry foodstuffs chests were coated with white iron. Bitts and bollards were formed with casted copper plates, capstans were installed with iron stocks. Ovens were installed in premises for dampness prevention. (RSA NAVY. f. 161, inv. 1, d.765, p. 12–31). The building process went fast, however on June 5th 1835 the Emperor enjoined to launch the ship certainly by August 1st. Therefore 100 free carpenters and 20 calkers were promptly detached from Galerny island. Besides, 40 men from St. Petersburg’s naval depots were allocated every day. Shipbuilding Department additionally issued a work order to contractor peasant Gregory Smirnov to post to the ship 100 carpenters more. On June 18th 1835 lieutenant-colonel Kolodkin reported to the Shipbuilding Department, that in order to launch the ship by August 1st he needs 950 carpenters, 150 general workers, 27 pair of sawyers and 40 joiners, and he has only 569 men at his disposal. The Department complied with the request of Kolodkin to add workers for building of the ship immediately, and from June 24th allocated extra 150 men from naval depo and 50 men from prisoner company. A few days later calkers, house painters and other specialists were added. (RSA NAVY. f. 161, inv.1, d.666, p. 262–273, 298–299). Ceremonial launching of “Lefort” took place ahead of time on July 28th 1835 with presence of Nikolay I. “His Imperial Majesty deigned to declare Yakov Kolodkin his benevolence for successful and correct building of 84-guns ship “Lefort” and for exemplary peace and order during launching, and for distinguished services he is promoted to colonel.” (RSA NAVY. f. 406, inv. 3, d.155, p. 38). After outfitting works in Kronstadt “Lefort”became operational ship of the Baltic fleet. Its gunning consisted of 32 36-pounds (172 mm) long guns on gundeck, 32 36 pounds (172 mm)short guns on upper-deck, 12 36 pounds (172 mm) carronades on Congreve carriages and 2 18 pounds (136 mm) long guns on quarter-deck, 4 36 pounds (172 mm) carronades on Congreve carriages and 2 18 pounds (136 mm) long guns on foredeck, 8 36 pounds (172 mm) carronades on Congreve carriages on waist and 4 18 pounds (136 mm) carronades on quarter-deck. – all in all 96 guns. Congreve carriages to the guns, which are more effective in recoil resistance as compared to common carriages, were also samples of new engineering, used on the ship. (Veselago, 1872). Dimensions of the ship were also imposing. It’s length – 58.3 m, width 15,6 m, depth of hold - 6.3 m. (MED II. 1993. p. 209). “Lefort” didn’t have occasion to take direct part in active operations. It made cruiser service on the Baltic Sea both in squadron and in solitary voyage, took part in various exercises and campaigns. In 1854 Grand Prince Konstantin Romanov took part in defense of Kronstadt from Anglo-French squadron. In subsequent years the ship was used for cargo transportation among Baltic sea ports. (“Naval Collection”. 1993. № 11. p. 32). In Summer 1857 “Lefort” as a part of a squadron of ships “Vladimir”, “Empress Aleksandra” and “Memory of Azov” was in Revel. There were no sea trips and the ships prepared for wintering. On August 28th commander of 2nd fleet division vice-admiral Mitkov received an order from general-admiral to tow by big steamboats all the ships of the division from Revel and Sveaborg to Kronstadt. It was noted at the same time that the ships should have nautical foodstuff for one month, take all state property, which belongs to them, all the crew and families of married lower ranks. In case of fair wind they could use sails to help the steamboats on the way. On September 4th a steamboat “Gremyashiy” came to Revel to tow “Memory of Azov” and the same day it went to Kronstadt. Head of naval depots in Revel rear admiral Nordman made an inquiry by telegraph on his own initiative to vice-admiral Mitkov. He asked if he could go under sail in case that steamboats don’t come and circumstances are favorable. Rear-admiral of His Imperial Majesty’s Suite Krabbe signed permission to passage to Kronstadt under sail in favorable circumstances. Head of detachment rear-admiral Nordman appointed “Vladimir” a flagship and hoisted broad-pendant. On September 6th he detoured the ships and ordered to move roadstead under sail and wait for steamboats. On September 7th and 8th there was easterly wind, opposite to move to Kronstadt and the detachment was at anchor. On September 9th the wind changed to fair, barometer showed 29,79. Rear-admiral Nordman found these circumstances favorable and at 9.30 a.m. he ordered to hoist sail and the ships departed to Kronstadt: first “Vladimir”, then “Empress Aleksandra” and finally “Lefort”. By the middle of the day the wind grew stronger, the speed increased. (Stetsenko, 1874. p. 78–97). About 8 p.m. the ships crossed leading line of Gogland lighthouses. Strong greyness, even more gusty wind with rain and snow, low barometer reading forced the detachment to hug behind the Gogland til dawn. Making short tacks, turning every time at a signal the ships by 5 a.m. on September 10th found themselves a bit north to Tuters island. When it was light, seamen on decks of “Vladimir” and “Empress Aleksandra” noticed, that “Lefort” had more heeling than the other two ships, which had ports of lower deck under water. In this position the ships started left tack. A gust came again and “Lefort” careened so much, that its second line began to disappear and it began to sink, going deeper with rostrum, than with stern. A lot of people appeared on windward nets. Soon the masts of the ship were in almost horizontal position and outer, upper side of the ship covered with a mass of people, but there came a wave and the mass became thinner. Another wave – and not a single person could be seen. Thereupon the ship itself disappeared. “Vladimir” was moving left tack and was in 4 cables from the disaster. Ends were prepared, but there were no traces both of the ship and of its crew. An eddy, formed by the ship, pulled everything to the ground. (RSA NAVY. f. 33, inv. 1, d.1110, p. 249–250). A state committee of enquiry was formed on occasion of wreck of the ship “Lefort” under the chairmanship of vice-admiral Rumyantsev and members rear admirals Lutkovskiy, Berens, captains Dugamel, Posiet and Taube. Looking through the investigation case, which is kept in Russian State Archive of Navy, reading testimony of admirals, officers, officials, seamen, who were related somehow to equipping of the ship to its last voyage ore who were witnesses of its tragic wreck it is important to note, how attentively everything, that was related to the case, was evaluated, compared and summarized. In spite of the fact that no one of the crew was saved, materials of investigation give us opportunity to define a number of reasons, aggregate of which led in critical moment of storm to wreck of the ship. The ship “Lefort” was built in July 1835, generally repaired in Kronstadt in 1847 and in 1852. It had enough navigability and stability and according to its technical data could endure heavy weather on the high sea. It had no battle or accident damages during 33 years of service, though the first signs of worsen strength of the hull appeared in 1856, when it was used as a cargo transport from Kronstadt to Sveaborg and then to Revel. It transported heavy-weight admiralty cargo, which consisted of stumps, logs, slabs, knees, mast logs, planks, flour and other issues with total weight of 26,7 thousand poods (about 435 tons) during the first tour and 22,5 thousand poods (about 366 tons) during the second tour. This cargo in both cases was placed (except minor quantity in bread room and in after-hatch) on the gun deck from deck to deck without any special fastening. Comparing this cargo with the weight of the artillery, which together with benches on the gun deck is about 8 thousand poods, we can see, that during the first tour beams of the ship were burdened with load two and a half times more than the weight of the artillery, and in the second tour with load more than two times heavier, than that of the artillery. The cargo placed in such a way even in light rolling must have affected the construction joints of the ship, especially on the underwater part of it and contribute to initiation of a leak with the first fresh wind. And indeed, when at the beginning of 1857 the ballast was trimmed back after cleaning the hold, a leak was found on the left side of the hull around the middle of the ship close to the keel. Second lieutenant of Navigators corps Shishutkin repeatedly reported to the captain about the leak in the hull of the ship, noticed by him during ballast trimming, but unfortunately his reports had no consequences. One should also pay attention to the evidence of lieutenant of 9th naval depot Demenkov, who noticed during his visit to the ship before sailing to the roadstead, that the ballast in the hold was poorly trimmed, that is why “Lefort” had left careen already on sailing to the roadstead. Lieutenant Bekleshev of the same depot informed that ports on the ship needed to be repaired and caulked, but hemp and fat for that purpose was not provided in full demand. There was lack of roundings for fastening of guns, artillery carts were unsafe, the cargo and belongings of the families were placed and fastened “badly”. According to important evidence by midshipman Tikhmenev for lack of hemp and fat calking of ports was made by old canvas and on the whole the ship was calked insufficiently. Taking into account that the summer of 1857 was hot and the ships stood all the time under the sun without leaving Revel harbor, lieutenant Rudnev assumed possible shrinkage of underwater body and decks of the ship. He gave as an example chinks one and a half finger wide on water-ways of the battery on the quarter-deck on his ship “Empress Alexandra”. Captain of the ship Izylmetiev testified the same. It was also mentioned, that there were inoperative pumps and rigging as a whole. It is natural, that technical unpreparedness of the ship to a distant tour reflected on the spirit of “Lefort’s” officers before they put to sea. Head physician of 9th naval depot court Counsellor Aleksandrov noticed: “I have heard the following from the officers of the lost ship: there is too little water in the coppers; the luggage of the lower ranks and their families on decks between berths is placed incorrectly, sacks with flour and so on. One could expect big careen and crankiness…There were stories about insecurity of block and tackle for guns… The ship had a quite noticeable left careen… It was obvious for me, that these talks were influenced by disinclination for the voyage.” (RSA NAVY. f. 33, inv.1, d.1110, p. 29, 48, 51, 83–84, 92–93, 102). Considering the causes of the disaster from different points of view, one should not overlook the research work by engineer N. Ogranovich, published in the magazine “Naval Collection” №1 of 1861. 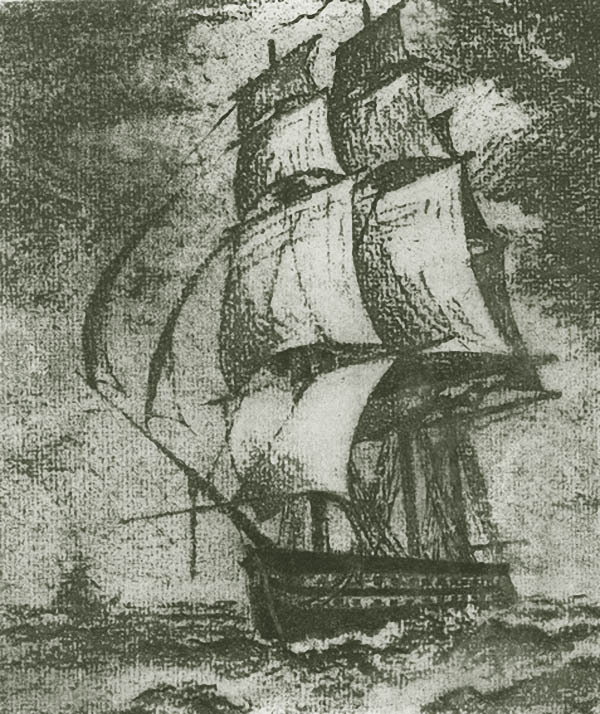 Taking as a basis for reasoning, that the ship “Lefort” was in a proper technical state and all its gunning was firmly fixed, the hull was firm and there was no leak, N. Ogranovich proves with the help of analytical calculation that the accident happened because of loss of stability as a result of serious underloading of the ship for passage under sail in storm conditions, as well as because of wrong positioning of cargo. Weight of all missing load with respect to fully equipped and supplied for the voyage ship was at the moment of accident according to N. Ogranovich's calculation 645,8 tons. This number involves underfilled water to the tanks, shortage of munition, naval and carpenter stores, and limited supply of foodstuffs etc. As we see from report of “Lefort’s” captain to port admiral before leaving to roadstead, the ship had a water supply for 14 days, and it took not more than 40 tanks. No report about filling the rest 150 empty tanks with sea water as a ballast followed from the roadstead, whereas captains of the other ships timely reported about filling free tanks with ballast water. In N. Ogranovich’s judgment since the ship put to sea nearly in empty condition, naturally it’s stability was substantially less than usual. At the moment of wreck the ship was in disadvantage regarding to wind and careen, and moreover, there came a squall, which lead to turnover. (“Naval Collection” 1861, № 1. p. 113–123). With the loss of the ship's crew and the passengers the true cause of the catastrophe was lost. On the basis of the gathered evidence the committee of enquiry came to conclusion, that the disaster happened to the ship still did not occur as a result of some fatal incident. Fresh breeze followed by a storm, raging in the Baltic Sea on the 10th of September 1857 caused about 30 shipwrecks of different types of ships. Most of them, both Russian and foreign, were thrown on rocks or on the shore in the areas of Revel, Moonzund Islands, Riga, Vindava, Libavaand other areas. “Lefort “ had enough seaworthiness, but that storm was the first one met by the ship after cargo transportation in 1856. It may be assumed that the great speed up to 10 knots at first and then rough and anomalous sea going on through the night loosened weak and ready to leak slots of planking and locks of wooden framing. Meanwhile big careen increased the strain of parts and even more loosened their connections. Though the port shutters were closed, but in disordered framing they did not close their ports tightly; the artillery, though it was fixed, rested on the construction elements, that moved, got itself the movement and in its turn loosened the connections. At the same time water must have flown by streams into ports, half-ports, scuppers and through the loosened connections of side planking and framing. A considerable sinking of the rostrum before the wrecking makes us suppose that one or more match-boards came off. Hawse-holes in this situation might have opened as well. Pumps at a big careen could not cope with pumping the water out, so a great mass of it having no possibility of going overboard constantly grew up and together with the wind tilted the ship more and more until it turned on its side and sank. Trying to comprehend the events of the tragic night and morning of September 10th 1857 we naturally ask question if everything was done by the captain of “Lefort” to prevent the tragedy? In its conclusion the committee of enquiry noticed very modestly only in the last three lines that timely measures preventing the wrecking of the ship in the night of September 9-10th were not taken by the captain. But was it only in that very night? The ship “Lefort” was under the command of the first rank captain Alexander Kishkin for a year and a half. By that time he was an experienced captain having more than 30 years of continuous record of active service on board of warships and for 9 years he commanded in order by brig “Agamemnon”, frigate “Diana”, ship “Sysoy the Great”. He took part in sailing abroad. (Common sea list P. X., 1898, p. 331–332). But let’s turn to the testimony of the witnesses once more. In 1856 during cargo transportation from Kronstadt to Sveaborg and then to Revel all necessary measures fastening and correct positioning of heavy cargo were not taken, which led to weakening of the hull structure joints. In spring of 1957 when cleaning the holds the causes of the discovered leak were not eliminated and the ballast was not laid with accuracy. In the reports to rear-admiral Nordman and the commander of the port Revel about the readiness for the passage to Kronstadt it was not mentioned about the abnormal leak in the hull and unreliable calking of ports. It is absolutely unclear why 150 water tanks used as a ballast on “Lefort” were not filled with sea water, though there was enough time to do that. There is no explanation as well why during the passage in situation of good visibility with the ships of the detachment there came not a single signal from “Lefort” of the disastrous situation of the ship. Probably the water streaming into the ship was not detected in time and when the danger became clear, the captain understood that it was useless to expect help from the others because of the stormy situation. Primary order about the passage to Kronstadt towed by a steamboat in favorable weather did not arouse any anxiety of the captain about the state of the ship. But when rear-admiral Nordman in the roads made a decision to sail to Kronstadt without waiting for steamboats, it was already late to do something.”Lefort” turned to be unprepared to such a passage. In the final conclusion of the sea general-audience under the chair of admiral Epanchin of December 23rd 1857 and uphold by Prince N. Golitsin, general-auditor of the fleet along with the causes of the wreck of “Lefort”, stated in the conclusions of the committee of enquiry it was pointed out: “The fate of “Lefort” depended only on the presence of mind and resourcefulness of the captain…The ship as a result of big careen and slow motion did not obey the rudder…At that moment there was one and last means: to cast an anchor. Then the ship turning against the wind would have taken straight position and could be saved.” (RSA NAVY, f. 33, inv. 1, d.1110, p. 337). But this was not done. This disaster was a terrible blow for the hearts of the sailors. Many broken-hearted orphans, families and relatives mourned over their dear ones in different parts of Russia. In 1858 under the impression of the wreck of the ship the allegorical painting “Memory of the lost ship “Lefort” was painted by the famous painter of seascapes I. Aivazovskiy. In the same year the painting was exposed at the Academy exhibition in St. Petersburg. It was bought by the Assembly of Officers and placed in the Kronstadt Sea Library. Now it is kept in Central Naval Museum. In memory of the sorrowful event an icon of Our Savior was also painted on the money gathered by subscription. This sacred image was kept in the manege church in Kronstadt. In 1868 V. Sazikov, who was one of the best gold and silversmiths in St. Petersburg and a Court Supplier made a silver wall icon-lamp for this icon. It represented a three-dimensional model of the ship “Lefort” sized 32x30x30 cm. The icon-lamp was made strictly in accordance with the drafts and had a laid-on inscription “Lefort”. In the central part of the deck in the inner room of admiral cabin the cup of icon-lamp is installed. Its light can be seen through the windows of the cabin. Total weight of the model with the icon-lamp is about 4 kg of silver. At present the icon-lamp is kept in the funds of the State Museum of the Religion History. The icon of Our Savior is unfortunately not found. The ship “Lefort” was one of the last representatives of domestic shipbuilding of sailing battleships in the first half of 19th century. It embodied the achievements of the sea practice and armament of that time. It is difficult to say, what is the state of the ship lying almost 60 meters deep between the islands Gotland and Bolshoy Tuters. Sea waves and time made their work, but the frame of the ship, its main parts, armament, and many other parts must be preserved. It goes without saying that all this is of great interest for historians of the fleet, of culture and for archeologists. It may be assumed that an expedition will be organized for the search and examination of this unique ship. At the same time the tragedy of “Lefort” once more reminds contemporary seafarers of the great role and responsibility of the captain of the ship of any rank in preparing the ship to the voyage, during the trip and in extreme situations. The sea does not forgive even the smallest neglect of the rules and regulations, self-sufficiency and carelessness. Veselago 1872 — Veselago F. List of Russian warships from 1668 til 1860 г. St.Petersburg. Karguev 1869 — Karguev N. The Russian Navyin the reign of Emperor Nikolay I St.Petersburg. 1896. “Naval Collection” 1861 — “Naval Collection” 1861. № 1. p. 113-123. “Naval Collection”1993 — “Naval Collection”1993. № 11. MED 1993 — Marine Encyclopedic Dictionary. Volume II. St.Petersburg. 1993. p. 209. Common sea list 1898 — Common sea list. Ч. X. St.Petersburg. 1898. p. 331–332. RSA NAVY. f. 406, inv. 3, d.155, p. 36-38. RSA NAVY. f. 161, inv. 1, d.666, p. 9–15. RSA NAVY. f. 158, inv. 1, d.745, p. 15–30; f. 327, inv. 1, d. 137–146, 397–400 (blueprints). RSA NAVY. f. 161, inv. 1, d.765, p. 12–31. RSA NAVY. f. 161, inv. 1, d.666, p. 262–273, 298–299. RSA NAVY. f. 406, inv. 3, d.155, p. 38. RSA NAVY. f. 33, inv. 1, d.1110, p. 249–250. RSA NAVY. f. 33, inv. 1, d.1110, p. 29, 48, 51, 83–84, 92–93, 102. RSA NAVY. f. 33, inv. 1, d.1110, p. 337. Skryagin 1986 — Skryagin L. Secrets of sea disasters. М.: «Transport». 1986. Introduction. Stetsenko 1874 — Stetsenko, rear admiral, ред. «Chronicle of wrecks and other disasters on warships of Russian Navy». St.Petersburg. 1874.